shopnewbalance.com: Get back to basics with Minimus. Get back to basics with Minimus. It’s hard to imagine a time before shoes, let alone running shoes, but before foam cushioning, rubber soles or performance fits, humans simply ran barefoot. In recent years, there has been a trend to go back to this basic form of running. Many runners have been tossing their shoes in favor of a barefoot run. In the modern world of streets and sidewalks this isn’t always practical. 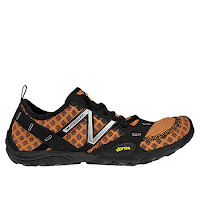 So, to bridge the gap between completely barefoot and the traditional running shoe, New Balance has created NB Minimus. To get the most benefit from NB Minimus shoes, it’s important to practice Good Form Running. (If you haven’t heard of this, view details and a video here.) Having the right posture, gait and pace is essential when using these shoes. For running, you’ll find they open a whole new experience. A great choice if you’re ready to take on a new challenge. Be sure you start slow, though. Because these shoes are so dramatically different from other running shoes, they do take some getting used to. When starting out, try to limit your use to 10% of your normal running routine, gradually increasing as you get more comfortable with them. View the complete NB Minimus line now. And remember, if you have any questions or comments about your experience with NB Minimus, share them here. I’m excited to hear what you think of these “less is more” shoes!